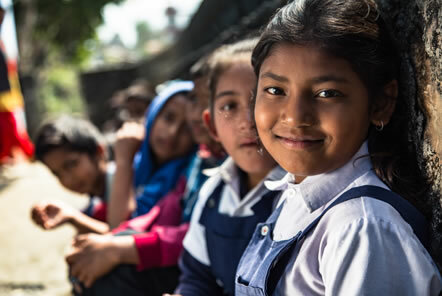 "Since the children have started to eat lunch at school, they seem to enjoy school even more and seem much more motivated in their lessons - as well as this more children have actually started to attend school as a result! The teachers from the school have let us know that they are very thankful for the donations from the Pod Charity and Outdoor 365 as they have found it very helpful for the growth of school and mostly for the children. They have a helper in the kitchen who cooks the food for the children. She is amazing at her work and makes the most delicious food you could imagine! 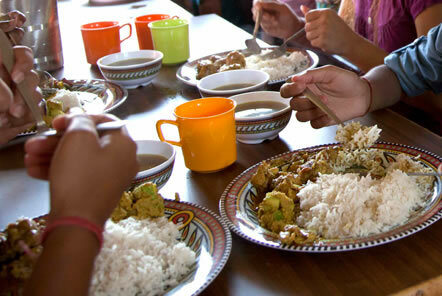 A while ago, when I was at the school with two of our volunteers we were offered some lunch, though we tried denying their offer as we wanted the children and the teachers to have enough they did not take no for an answer and shared with us a little of what they had after feeding all the children. To be able to see the money was being used for the right thing in a very sensible was a very good feeling. Also the teachers offering us food with the least they had and them being delighted by us tasting the food was a very humbling experience. The food of that day was, egg and potato curry with beaten rice. 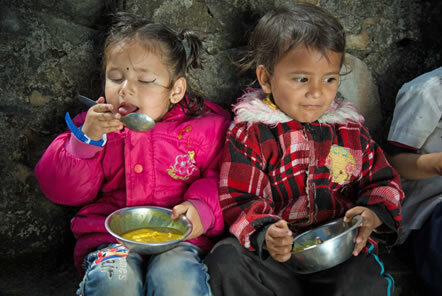 It was a great feeling to know that the children are getting to eat healthy and tasty food at school. The teachers aim to ensure that the children are getting fresh food every day. So their lunches include egg and potato curry with beaten rice, noodles with vegetables, rice cooked in lentils with vegetables, Nepali style fried beans, vegetables, rice pudding which includes milk in it, yogurt and beaten rice, chicken and beaten rice (on rare occasion as it is meat is very expensive) and variety of fruits depending on the season. The majority of the children who attend this school come from a poor family background which makes it difficult for them to provide the children with nutritious food on a regular basis in their homes. Consequently, the children get protein and other vital nutrients in their meal at school that they lack in their normal daily diet. Fruit isn’t something that is usually widely eaten in Nepal except during festivals. Many people have not been educated on the importance of eating fruit, and on top of this, fruits are very expensive so it is often hard for low income families to see the value in buying them. Annapurna Primary School with the help of Pod Volunteer makes sure that the children get to enjoy all kinds of fruits, so they include grapes, apples which are one of the expensive fruits along with orange and bananas, cheaper and seasonal ones. They try to include one fruit that is expensive and try to give them even if it’s not a huge amount, something that is just enough for the children to get their nutrients from different kinds of fruits. It is always a pleasure seeing this tiny school composed of just 4 classes and 3 classrooms make the best out of what they have. The teachers there and in other schools that we support often say that because of the help we are giving them they have been getting students on a regular basis and are able to teach and provide for them. It is the meals that attracts most of the children to come to school and the teachers are being able to educate children who otherwise would have been deprived of any sort of education. Even though, it is not a huge amount of money that we are providing them, it does a great job in the lives of those young children coming to this small community school and making a huge difference in their lives. So thank you so much to Outdoor365 for helping to make difference to these childrens' lives." We are very grateful to be supported by the Outdoor365 group the Cheltenham based business behind Multi-tool-store, Swiss-Store, LedLenser-Store, Buck-Store, True Utility, Gerber-Store, Headtorches365 and Farrar-Tanner ecommerce stores.